NCS Technologies packages sophisticated rugged and easily deployable IT infrastructure to support any need to rapidly deployment to the field. Rapid and flexible response with the right IT infrastructure is the key. This is paramount for the military, for civilian agencies responding to emergency situations, as well as first responders, and even industry, such as oil and gas and utility companies working in very harsh environments. With deployable NCS Rugged and Mobile Infrastructure Solutions, NCS has packaged super reliable IT infrastructure capability to meet practically any need. When flexibility is paramount, the Getac V110 Fully Rugged Convertible fits the bill. It is a compact and lightweight and quickly transforms from an 11.6 inch display notebook to a tablet computer. In the field this flexibility can be very handy when the immediate need for a mobile tablet presents itself. In most deployments rugged laptops are a must. The Getac S410 Semi-Rugged Notebook delivers strong performance, security and durability in a thin form factor. Experience the fast 8th generation Intel i7 processor, airtight security tools with multi-factor authentication and customization features to fit any workflow - all engineered into a thinner, more durable design. Getac's B300 remains very popular in the field. It delivers high performance, security and long battery life. The notebook has one of the brightest displays in the industry and offers 4G LTE wireless. The B300 is Getac's most popular model and performs in some of the most extreme conditions around the world. In specific military or intelligence applications, virtualization may be desirable. NCS offers a full portfolio of zero client end points based on the PCoIP protocol. If your deployable situation calls for virtualization in the field for security or convenience, NCS delivers. 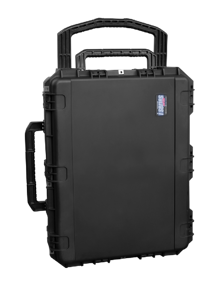 NCS has the industry's only mobile notebooks, the Cirrus LT and Cirrus LT Plus, that fit into customized transit cases and delivers simplicity, scalability and security. Learn more about our deployable portfolio!